It’s not always easy to find a product that offers the exact same thing you’re looking for. In fact, more often than not, people have to compromise and invest in something that can ultimately turn out to be a mistake in the long run. While it’s not a thing you should be worried about too much because it will happen from time to time, there are some things you can pay attention to in order to reduce the risks. One of those things is – research. Nothing yields better results than quality research and a good understanding of how these things work. We are here to help you overcome some issues when it comes to buying power tools. Because these machines aren’t cheap and most of them are in fact a hefty investment, one should have as much insight as possible into the capabilities of a particular model before deciding whether or not it’s worth buying. If you’re interested in purchasing a decent bandsaw with good features, take a look at this unit, it offers good performance for a reasonable price. This particular model is a go-to solution both for DIYers and some professionals. The 3.5-amp motor outputs enough power to cut through wood without breaking a sweat. The machine is easy to use, comes with a couple of useful features, and most importantly – it’s budget-friendly. The included additional accessories are what makes this unit stand out in comparison to some other ones that are in the same price range. The included LED light, miter gauge, stand, and dust port are all great accessories that alleviate some of the hassles. The design is pretty neat and user-friendly. The materials used in production are sturdy and reliable. In fact, the majority of included components are made of steel, aluminum, and other trustworthy metals. Therefore, one doesn’t have to worry about longevity or stability. Speaking of stability, the included stand is one of the crucial factors that ensures smooth operation and absence of wobbling. 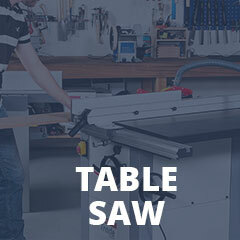 The spacious worktable helps a lot if you’re planning on processing bigger pieces of wood. It allows you to cut downtime significantly and improve the overall accuracy of your cuts. The motor operates at two different speeds, depending on what you are cutting. Some other units can cut through some metals thanks to the multi-speed feature, but this one isn’t foreseen for such applications. It’s not an entirely impossible endeavor by any means, but it’s not something that’s recommended by the manufacturer. As we already mentioned, there are quite a few additional features that make this particular model stand out. Even though the LED light doesn’t seem like an impressive addition at all, many people appreciate it nonetheless. It allows you to have a better understanding of things that are currently happening on the worktable. Also, it comes in handy if you’re frequently working under dim conditions. The dust port is also a welcomed feature even though not many people actually put it to work. On the other hand, if you own a vac and like to keep the debris under control, this 3-in-1 dust port will certainly make things much easier. The fence and miter gauge are somewhat standard pieces, even though there are some models that come without these included. On top of that, most of those models are similarly priced as this one, which means that this one does offer slightly more in comparison to its competitors. The completeness of the WEN 3962 is its main selling point. In other words, it’s an all-around model with a bunch of auxiliary features that will more than likely make things much easier for an average user. On top of that, it’s a relatively simple machine meaning you don’t need years of experience in order to use its full potential. The motor is powerful and it will consistently yield good results. Many people are worried when it comes to the overall power output, but you can rest assured that it’s sufficiently powerful for most applications. The included stand is not impressive per se, but it’s definitely much better than most others within this price range. Many people complained about the lack of WEN’s quality control and we think there is definitely a good reason for that. The main component that seems to break frequently is the tension knob. It is indeed a piece made of plastic and it can struggle to withstand the intensity that comes with massive projects. Whether or not you’re ready to risk it is up to you. As far as we are concerned, it’s not something that should be a deal-breaker, but it’s definitely something to be worried about nonetheless. Aside from some minor flaws, this power tool comes pretty well-equipped. Most people love its versatility and the whole all-around concept, but some users don’t like the fact that it doesn’t do well with anything except wood. Therefore, if you’re in need of a unit that cuts through metal with the same precision and consistency as with wood, then this one probably isn’t the best solution. In fact, don’t purchase this unit for anything other than processing wood. If you’re on a limited budget, we recommend that you look into this particular model. It’s certainly not the best thing on the market by any means, but its price-to-quality ratio is pretty good. In other words, you probably won’t find a significantly better unit than this for the same amount of money. The included features are good and you can count on them most of the time. The machine is somewhat consistent when it comes to smoothness and performance, but it can occasionally struggle with some tasks. Overall, it’s a worthy investment as long as you don’t overuse it.